Observed at Naiberi River Camp, s.e. of Eldoret, Kenya, Africa. October 2010. Elevation 2300 meters. 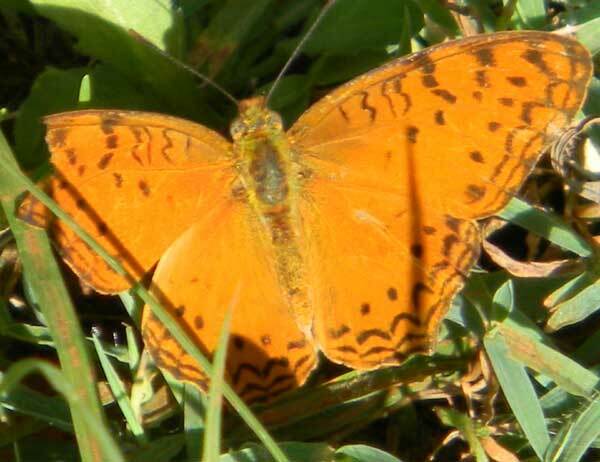 The Common Leopard butterfly has a wide distribution across much of Africa south of the Sahara and also in the south of Asia. The wing span is on the order of 5 cm. It is also conspicuous in that it basks open-winged in the sunshine. The butterfly shown here has wings damaged by encounters with predators, spiders or weather events. The fragility of butterflies means that most rarely survive more than a month as an adult. Copyright Michael J. Plagens, page created 17 Dec. 2010.